It is important that you pay your rent on time. If you are finding it difficult to pay or have fallen into arrears the most important thing to do is to contact the housing management team. 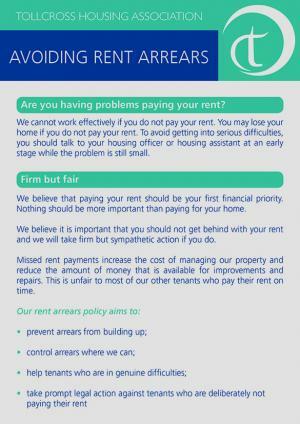 Most problems with rent arrears can be sorted if early action is taken. If you are in arrears we can agree a suitable repayment arrangement to pay off the debt. All discussions will be treated confidentially. Just make an appointment with your Housing Officer who will discuss all of your options. If you are on Income Support or have a low income you may be entitled to Housing Benefit. This can cover all or part of your rent depending on your household income and how much rent you pay. We have a dedicated Welfare Benefits Officer who will be happy to assist you with applications for housing benefit or other entitlements. Just phone our office for an appointment or pop in to the drop in service on a Tuesday and Wednesday mornings (9.00am – 12.00 noon). If you would rather not call into the Association office we have specialised staff based at the Tollcross Advice Centre who can provide advice on money matters and other benefits. If you require assistance or wish to arrange an appointment please contact the Housing Management Team. Remember, if you do not contact us or keep to arrangements made, the Association may be forced to take legal action that could result in you losing your home.